North Korea on Sunday celebrated the 70th anniversary of its founding with a massive military parade in Pyongyang, but the event was largely understated with the absence of intercontinental ballistic missiles and a speech by North Korean leader Kim Jong-un. The military parade held in Pyongyang involved tanks, artilleries and goose-stepping troops walking past Kim and his foreign delegates, but ICBMs were not displayed during the two-hour event that ended in the morning. Kim observed the event along with Chinese leader Xi Jinping’s envoy Li Zhanshu, but he did not deliver a speech to the public. Instead, the country’s ceremonial head of state Kim Yong-nam addressed the assembled crowd with a focus on economic development rather than nuclear might. In his New Year’s message in January, Kim had pledged to celebrate the country’s 70th anniversary with “utmost grandness” after declaring the completion of nuclear capability and vowing to shift its focus to economic development. But talks between North Korea and the US have stalled despite their first-ever summit in Singapore in April. US President Donald Trump postponed State Secretary Mike Pompeo’s planned trip to Pyongyang. In the meantime, international sanctions continue to eat into the North’s economy. The circumstances might have prompted Kim to demonstrate a “different attitude” from the North’s previous military parades, through which the country has stunned the world with advanced ballistic missiles and bellicose rhetoric, analysts say. “Now that Kim and Trump have pledged to trust and respect each other, Kim wants to come off as a trustworthy and considerate partner to Trump,” said Kim Dong-yup, a professor at Kyungnam University’s Far East Institute. According to the South Korean envoy who met with Kim Jong-un last week, the North Korean leader said his faith in Trump remains unchanged and he wants to denuclearize the Korean Peninsula during the US president’s first term. Despite efforts to tone down the parade, there is one remarkable image that has captured the international audience. 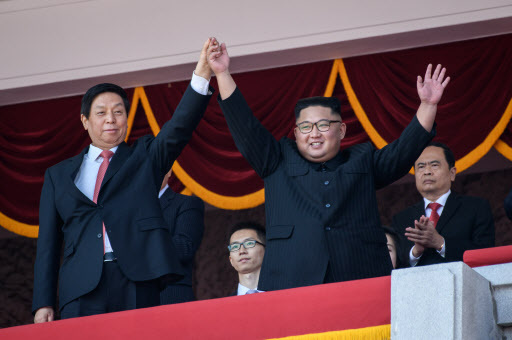 At the end of the parade, Kim and Chinese envoy Li locked hands and raised their arms to symbolize the countries’ traditionally close ties. In his congratulatory messages, Chinese leader Xi said China is pursuing an “unshakable policy” to enhance relations with North Korea. Xi had been expected to meet with Kim during the founding day anniversary. “The Chinese Party and government took seriously (our) friendly, cooperative relationship with North Korea. … Protecting and improving the bilateral relationship is our unshakable policy,” Xi was quoted as saying by KCNA. North Korea’s state-run media continue to remain silent about the military parade. In the past, the event had been broadcasted live or aired later with recorded footage. The latest February parade was delivered with a recorded version. Despite the absence of ICBMs and Kim’s speech, South Korean intelligence officials said Sunday’s parade involved the participation of more soldiers than in February. Regarding the exact types of weapons displayed in the parade, the officials said further analysis is needed. The officials, who requested anonymity, said the event was held at a “similar time frame” to February’s one, with a “slight increase” in the number of participating troops. Involving 12,000 troops, February’s parade kicked off around 11:30 a.m. and lasted for 1 1/2 hours. To commemorate the national event, Kim paid a visit to a memorial site in Pyongyang where the bodies of his father Kim Jong-il and grandfather Kim Il-sung are buried, according to Pyongyang’s state-run media. The Korean Central News Agency reported that Kim and his entourage -- including his right-hand man Choe Ryoung-hae -- visited the Kumsusan Palace of Sun. It was Kim’s first known visit to the mausoleum since 2012. Kim also welcomed foreign delegates attending the celebrations over the weekend. While the event was overshadowed by the absence of regional allies’ leaders, China and Russia sent their senior representatives and congratulatory messages to mark the occasion. Valentina Matvienko, speaker of the upper house of the Russian parliament, met with Kim on Saturday. The Russian politician said in a media interview that Kim confirmed his readiness to visit Russia.